Which companies are winning in the plant science market? We’ve updated our research area datasets, and today we’re going to take a look in some detail at the plant science section of this. The full dataset covers 12 research areas, outlining the supplier, institution and product citation shares within each. This is an update on the research area dataset we produced in 2014. The team at CiteAb has produced this updated dataset based on citation data from 2012 to 2017, looking at a total of over 350,000 citations. To explore the plant science research area they have analysed over 1,800 citations, for 850 antibodies, and 36 suppliers. This gives a really good insight to the global market, the institutions doing the most plant science research, and the suppliers that are really succeeding. “This might be a small research area, but it is of huge importance for our future. 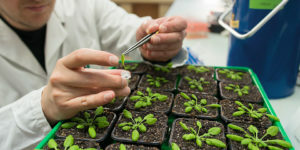 Plant scientists are researching opportunities for new fuel sources, through to new medicines and even looking at the sustainable production of food for a growing population. Really the range of issues being addressed is extremely large and covers global problems essential to human wellbeing. However, there has been a lot of change among those companies that are supplying the plant science research area since we last wrote about it in 2014. Abcam currently hold the largest citation share, with 20.64 per cent, with Agrisera in second place by the narrowest of margins, holding 20.06 per cent of the citation share. Rhys adds: “Abcam are a global juggernaut in the life science industry and provide a wide and growing range of reagents for the majority of research areas. As a result of this approach they have successfully attained a large share of the citations in most of the research areas and are therefore a very strong competitor. Agrisera has just a fraction of the antibody catalog that Abcam offers, but has amassed a citation share nearly on par with that of Abcam in the plant science research area. Today we’re giving away the names and percentage market shares of the top five plant research antibody suppliers for free, you just need to sign up below to get the data sent to your email. If you’d like to discuss the broader research area dataset with us, please contact Rhys and he’d be happy to help you.